President Obama just released his fiscal 2015 budget[i] that spends lavishly on his pet projects including his epically-misnamed “all of the above” energy program. But, instead of keeping miners in their coal jobs that historically supplied the nation with most of its electricity, he is putting his dollars on ‘clean coal and natural gas’; instead of opening more federal lands to oil and gas drilling, he is taking away standard tax deductions as applied to the oil industry and providing subsidies to inefficient technologies that supply just 2 percent of the nation’s energy. In other words, he just continues to propose that taxpayers throw even more good money after bad, in fulfillment of his campaign promise from 2008 to make “electricity prices necessarily skyrocket.” Let’s take a closer look at the President’s energy wish list. Let’s look at the energy sector more closely. The budget calls for increasing taxes on oil, gas, and coal that would amount to $4 billion annually and $48.8 billion over ten years. The budget calls for $27.9 billion to fund the Department of Energy (DOE), an increase of 2.6 percent over last year’s funding levels. Of that, the Office of Energy Efficiency and Renewable Energy receives $2.3 billion, an increase of 20 percent from the fiscal 2014 spending bill, of which renewable energy gets a 16 percent increase. But for DOE’s Fossil Fuel program, funding is reduced from last year’s levels. Out of this reduced budget DOE is somehow supposed to make it possible for the United States to be able to use its enormous supplies of oil and gas and coal, despite the Administration’s regulatory war on each of these traditional energy sources. Instead, the DOE Fossil Fuel program includes funding on research for the misnamed “clean coal and natural gas” technologies. (These programs are misnamed because they are concerned about reducing carbon dioxide emissions, but carbon dioxide emissions, no matter how concerned you are with global warming, are not dirty in any sense of the word “dirty” in English). According to Secretary of Energy Moniz[ii], “Certainly, if you look decades ahead for natural gas — as with coal — to be a major player in a very low-carbon world, it will require CCS technology here, as well.” The DOE budget would also foster research on gas hydrates and an interagency collaboration on shale development. $39 million to support the agency’s new Office of Energy Policy and Systems Analysis which would probe fuels and infrastructure resilience as part of DOE’s Quadrennial Energy Review. As for renewable energy, the budget calls for a permanent extension of the production tax credit (PTC) for wind power—a tax credit that expired at the end of 2013. It should be noted that even the wind lobby suggested phasing out the PTC over six years, so the President’s budget requests more subsidies for wind than the wind lobbyists asked for. If extended, it would cost $19.2 billion over ten years. It also calls for extending a tax credit for cellulosic biofuels that also expired in 2013. In addition, the budget calls for establishing an “Energy Security Trust” of $2 billion invested over 10 years. The money would be drawn from revenues generated from Federal oil and gas development and would help support research and development in technologies such as advanced vehicles that run on biofuels, electricity, renewable hydrogen and domestically-produced natural gas. The Administration has specifically clarified that this proposal, first floated last year, does not involve any new revenues to be generated from new energy activities that the Administration has opposed, such as ANWR, opening the OCS, etc., but instead will come from existing planned development. This is, therefore, a $2 billion gimmick that involves borrowing more money and acquiring more debt to pursue additional programs such as those that produced Solyndra. Note also that the “Energy Security Trust” does not mention coal, despite the fact that the United States has more than 400 years of coal in its Demonstrated Reserve Base. If the President were truly serious about energy security, coal would be included. The U.S. DOE portion of the President’s budget also provides $253 million for development and demonstration of advanced biofuels, specifically mentioning “drop in” replacements for gasoline, diesel and jet fuel. This begs the question, “why?” The U.S. has billions of barrels of conventional oil that would not require hundreds of millions in subsidies, but would generate billions of dollars of revenue for the federal government if the Obama administration would allow more exploration and production. As the president recently announced, the budget calls for a new $1 billion “climate resilience fund” that could be spent on whatever he wishes, to include research into the effects of climate change, development of new technologies and climate-resilient infrastructure, and helping communities address the local effects of climate change. While Secretary Moniz touts the President’s “all of the above” energy strategy, he is either ignorant of what the word “all” means or he is being intentionally deceptive because the President’s plan is missing any promotion of conventional energy sources. It does not support opening new Federal lands to oil and gas development. It does not call for additional leasing of currently opened Federal lands to natural gas, coal, and oil development for which the Department of Interior has drastically reduced lease sales and slowed the issuance of permits. It does not cancel the onerous regulations that the Environmental Protection Agency (EPA) is mandating on coal-fired power plants and coal mines that have cost many miner jobs in coal-producing states nor does it provide these miners with any hope of jobs with commensurate salaries. As a result, it does not provide the American public with a safe, affordable, and secure energy future despite the trillions of dollars that would be spent if enacted. Forecasters are all indicating that our energy future, at least through 2040, will be based on fossil fuels. For example, the Energy Information Administration (EIA) believes that 80 percent of our energy consumption in 2040 will be from fossil fuels, with an additional 8 percent from nuclear energy. Yet these fuels are getting the short shrift of President Obama’s energy budget so that his ‘pet’ technologies can eke out another fraction of a percent of the energy pie. Let’s look as Obama Administration’s track record. 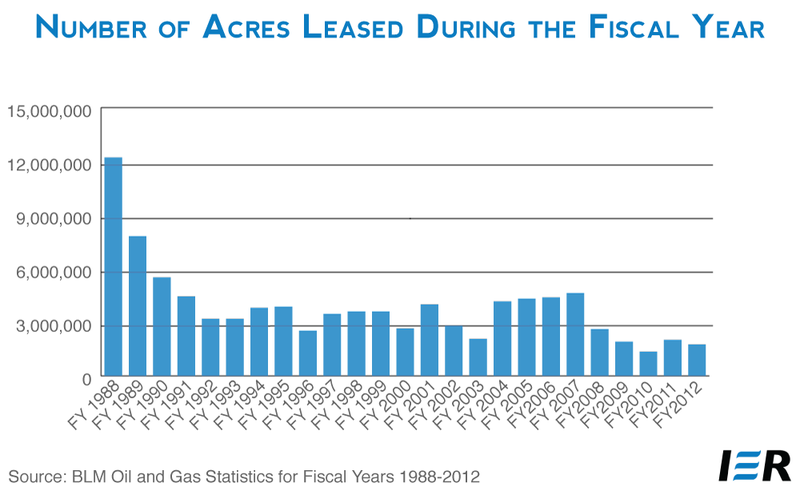 The following chart shows the average number of new leases on Federal lands that the Bureau of Land Management issued during each administration. While the trend is down under all administrations covered, the Obama Administration had the lowest—half that of the Clinton Administration and a third less than the George W. Bush Administration. In President Obama’s first term from 2009 to 2012 a total of 6.9 million acres were leased on Federal lands– less than half of the 15.9 million acres leased under George W. Bush between from 2005 and 2008. The Interior Department has leased just 2 percent of federal offshore areas and less than 6 percent of federal onshore lands for oil and gas development. This is particularly important because, while the entire United States including Alaska and Hawaii consists of 2.271 billion acres, the government owns mineral access to 2.4 billion acres because of the Outer Continental Shelf. Despite a large endowment of oil and natural gas resources on federal lands, which include offshore resources, oil and natural gas production is declining on federal lands in the United States. 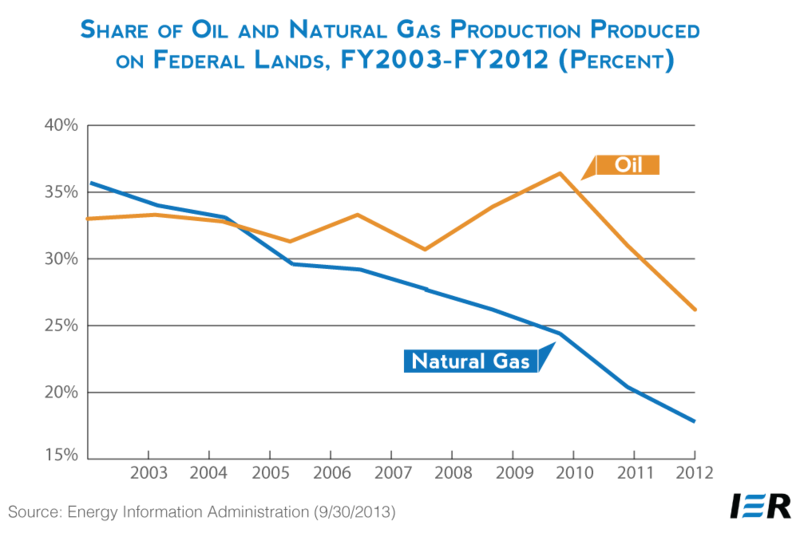 The graph below shows the share of oil and natural gas production that came from federal lands. The share of oil production from federal lands peaked in fiscal year 2010 at 36.4 percent, but has declined by 10 percentage points to just 26.2 percent in fiscal year 2012. Natural gas production on federal lands peaked at 35.7 percent in fiscal year 2003, the first year that the Energy Information Administration reports the data, and has declined ever since reaching half that share in fiscal year 2012–-17.8 percent. 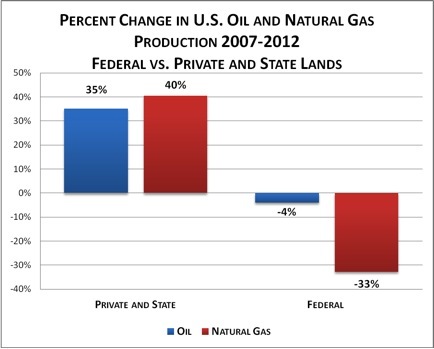 The falling production on federal lands is in stark contrast to the dramatically increasing production on private and state lands, for which President Obama likes to take credit. According to a recent report from the Congressional Research Service, from 2007 through 2012, oil production grew by 35 percent and natural gas production grew by 40 percent on private lands while oil production fell 4 percent and natural gas production fell 33 percent on federal lands. Oil companies prefer to drill for oil on private and state lands because there is a lot less red tape, and the state regulatory agencies work closely with the oil companies to provide certainty in the regulatory process. 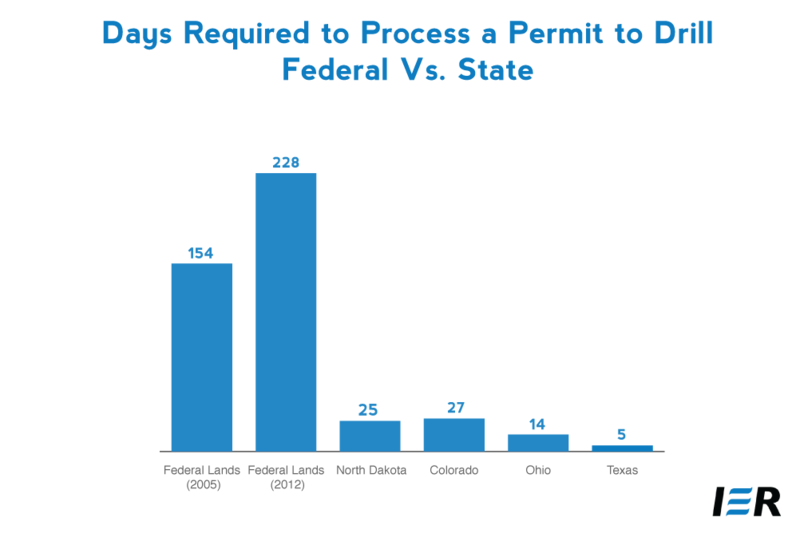 For example, the state of Texas processes a drilling permit in 5 days, and North Dakota in 20 to 30 days, while the federal government’s Bureau of Land Management now takes over 200 days to process a permit, an increase of almost 50 percent since 2005. Likewise, coal production on federal lands is also declining under the Obama Administration. Coal production on federal and Indian lands peaked at 509 million short tons in fiscal year 2008 and has been decreasing slightly each year since then. In fiscal year 2012, coal sales from production on federal and Indian lands reached 461 million short tons, a 1.7-percent decrease from fiscal year 2011 and over a 9-percent decrease since the peak in fiscal year 2008. 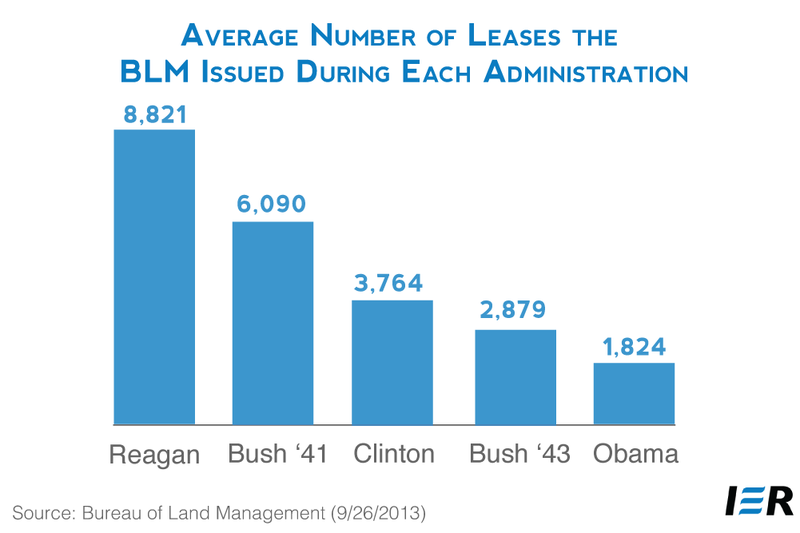 According to data from the Bureau of Land Management, there have been fewer coal lease sales on average under the Obama Administration than there have been under the George W. Bush and the Bill Clinton administrations. President Obama’s war on coal continues with onerous regulations on coal-fired power plants. 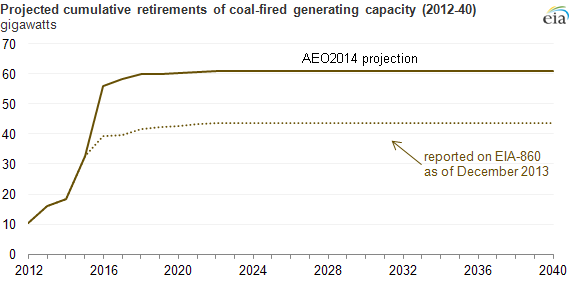 As of December 2013, reported retirements of coal-fired power plants by electric utility companies have grown to over 40 gigawatts. But, the EIA forecasters believe that the number of coal-fired retirements will be higher at 60 gigawatts, about 20 percent of the 310 gigawatts of coal-fired capacity that was operating in 2012. Ninety percent of those retirements are expected to occur by 2016, coinciding with the first year of enforcement for EPA’s Mercury and Air Toxics Standards. According to EIA data, coal-fired generation declined from almost 50 percent of the electricity market in 2008 to as low as37 percent in 2012 due to competition from low natural gas prices and EPA regulations. With its major consuming sector reducing demand, coal production declined by 15 percent between 2008 and 2013. Along with the production declines, average coal mine employment fell as well. According to the U.S. Mine Safety and Health Administration, the average number of coal mine employees in 2013 fell by almost 10 percent from 2012 levels, to 82,338 employees. In the fourth quarter of 2013, the average number of coal mine employees was lower at 77,639, the lowest level since the first quarter of 2009. Between the fourth quarter of 2011 and the fourth quarter of 2013, average coal mine employment dropped by over 17 percent. President Obama’s “all of the above” energy strategy is an egregious misnomer and does harm to the English language. It is terms like this that George Orwell was describing when he wrote, “Political language — and with variations this is true of all political parties, from Conservatives to Anarchists — is designed to make lies sound truthful and murder respectable, and to give an appearance of solidity to pure wind.” President Obama’s 2015 budget request is pure wind.